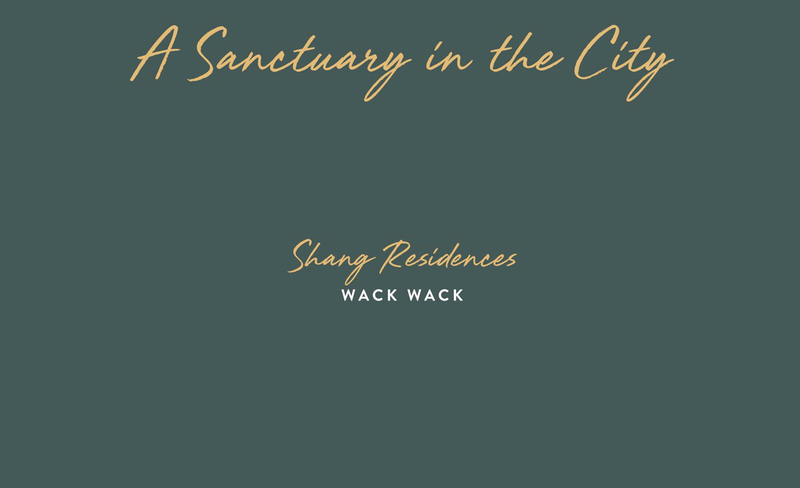 o What is Shang Residences at Wack Wack? 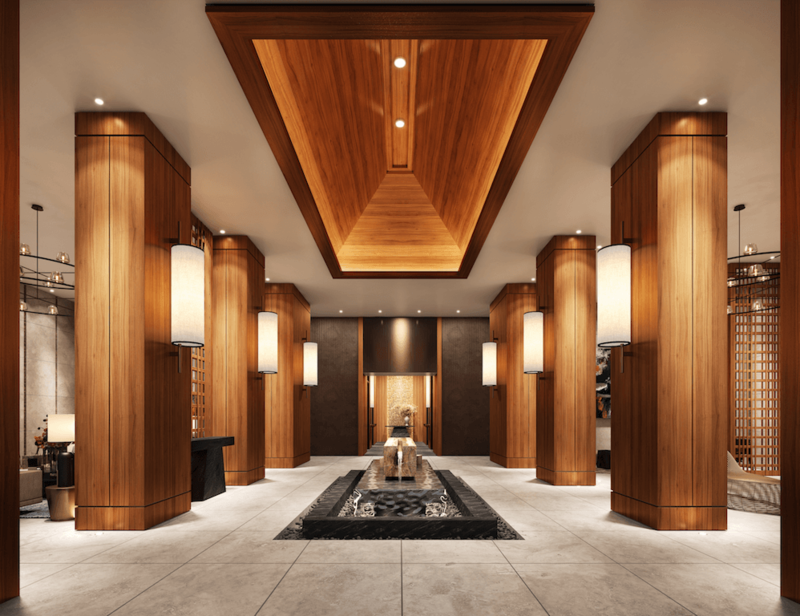 Shang Residences at Wack Wack is a luxury high-rise residential development showcasing the signature Shang Properties living experience — superior amenities, outstanding architecture, and world-class design, all reflecting the prestige and comfort of the high life. This 50 storey condominium, with an approximate height of 165 meters, joins the groups’ other prominent developments such as Shang Salcedo Place, The Shang Grand Tower and The Enterprise Center in Makati, The St. Francis Shangri-La Place, Shangri-La Plaza mall, One Shangri-La Place in Ortigas Center, Horizon Homes at Shangri-La at the Fort. Construction is currently on-going for The Rise Makati. o What are the landmarks? Conveniently nestled between Greenhills and Ortigas, and within easy travelling distance to both Ortigas and Makati central business districts, the Wack Wack neighborhood is home to some of the best schools, universities, medical facilities, and shopping that the city has to offer. The best hospitals and medical facilities in the country are conveniently located near Shang Residences at Wack Wack, including the renowned Cardinal Santos Medical Center, The Medical City, and Victor R. Potenciano Medical Center. Access the finest shopping, entertainment, and dining experiences Manila has to offer such as the markets of Greenhills, the latest international brands at Shangri-La Plaza, and new retail experiences across a range of other malls. Wack Wack is the ideal neighborhood for young and growing families, with some of the most prestigious schools in the country within walking distance— such as La Salle Greenhills, Xavier School, Lourdes School of Mandaluyong, and Immaculate Conception Academy. Some of the country’s best higher-learning institutions are within easy reach such as University of Asia and the Pacific and Jose Rizal University. o How many parking levels are there? The residential tower will have five (5) basement parking levels. 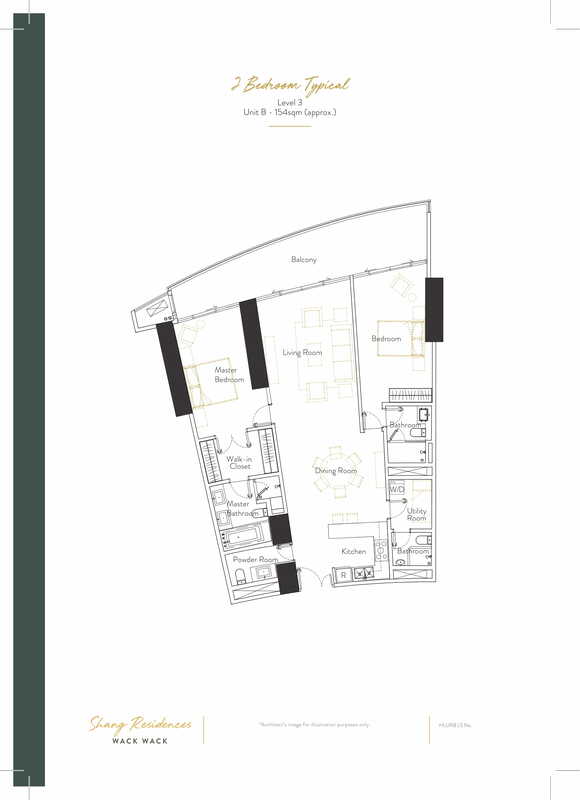 o What is the lot size or area of Shang Residences at Wack Wack? 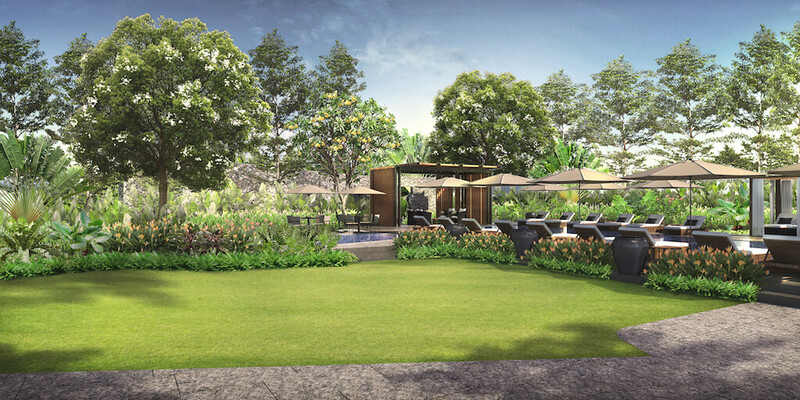 The lot size of Shang Residences at Wack Wack is approximately 3,361 sqm. o How many units will there be? 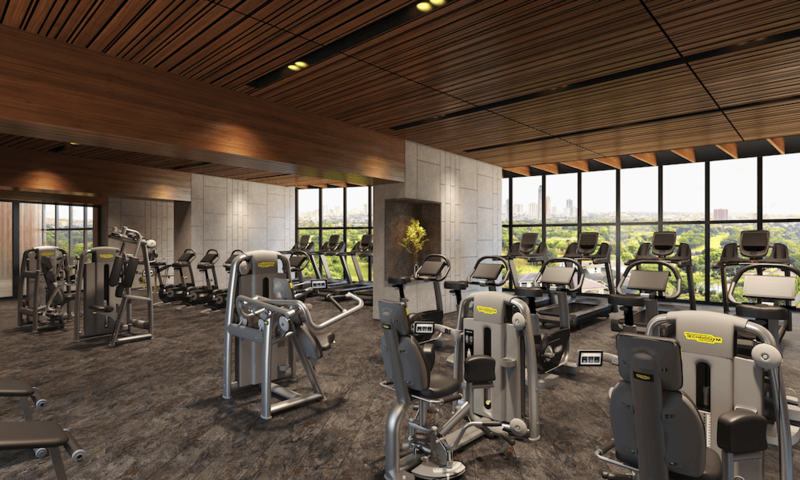 There will be a total of approximately 460 units including the Penthouse and Simplex units. o How many units will there be on each floor? 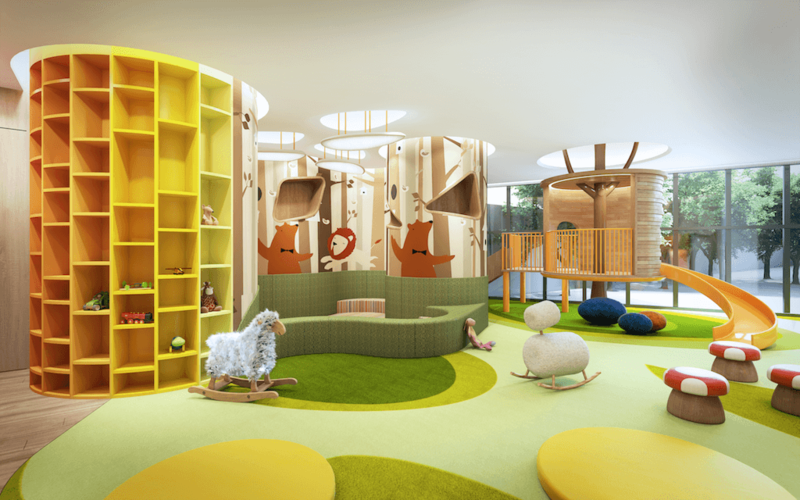 A typical floor will have approximately 10 units, while the highest floors will have six (6) units. 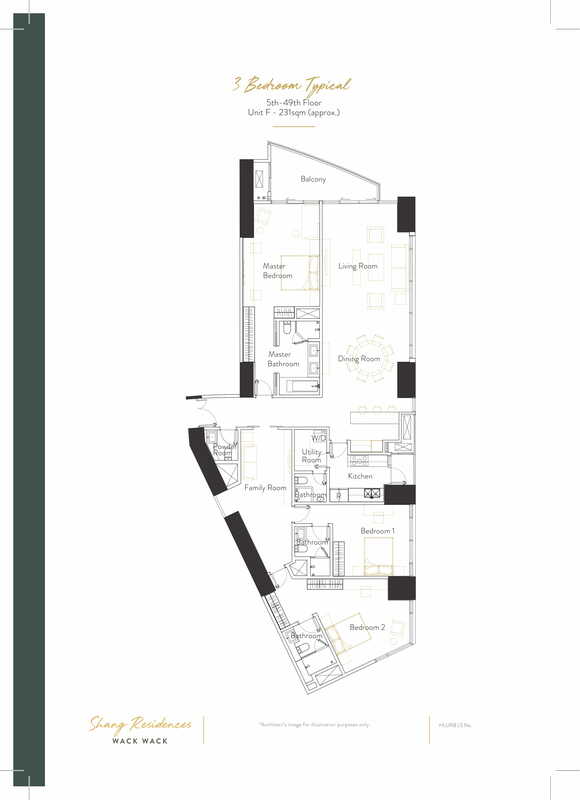 o What is the floor area of the Typical One-Bedroom unit? A Typical One-Bedroom unit is approximately 81 to 85 sqm in size. 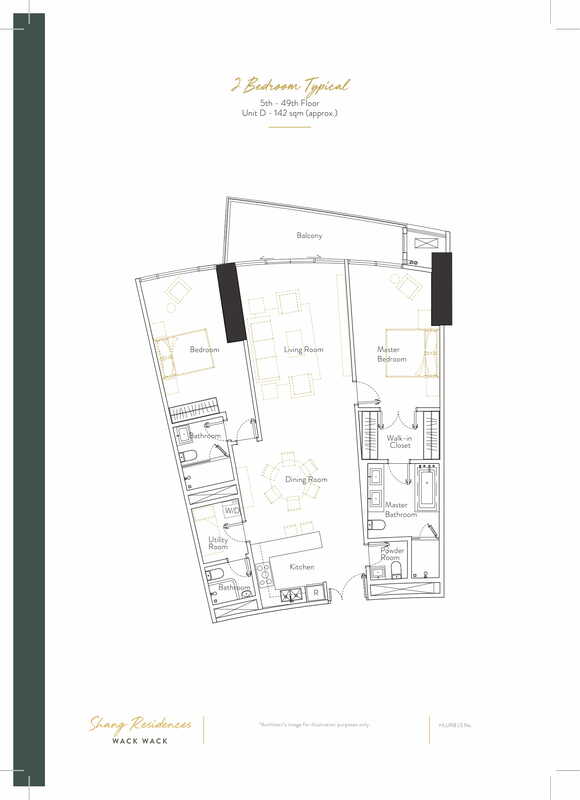 o What is the floor area of the Typical Two-Bedroom unit? 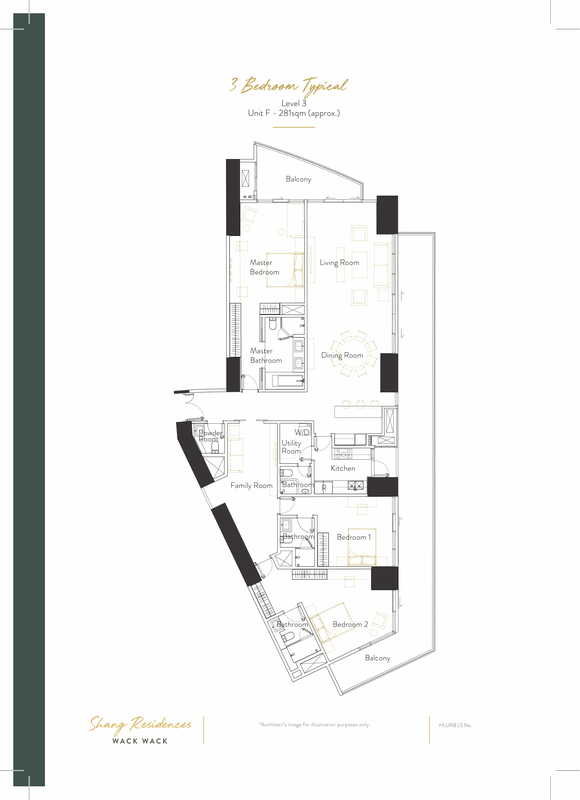 A Typical Two-Bedroom unit is approximately 142 to 145 sqm in size. 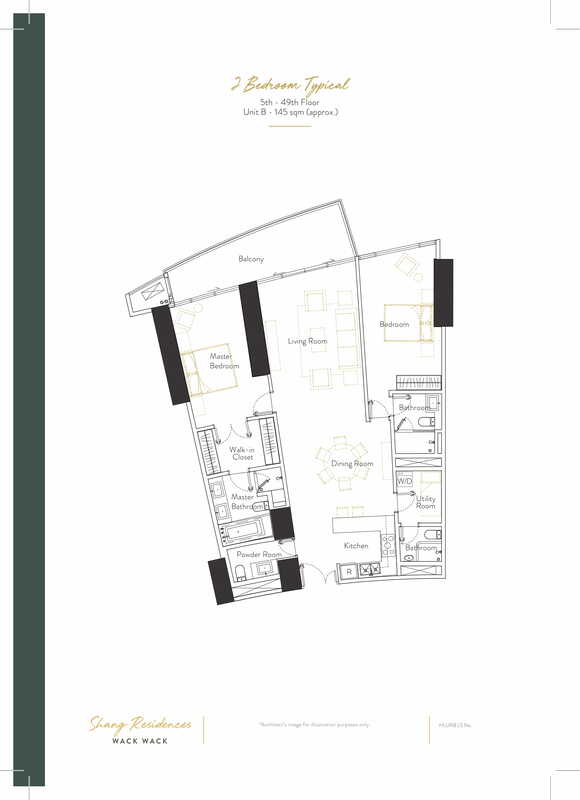 o What is the floor area of the Typical Three-Bedroom unit? 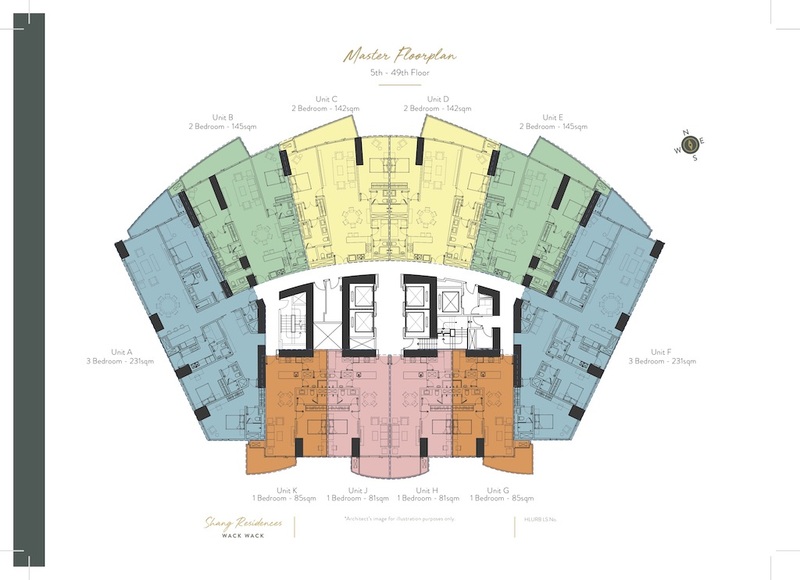 A Typical Three-Bedroom unit is approximately 231 to 232 sqm in size. 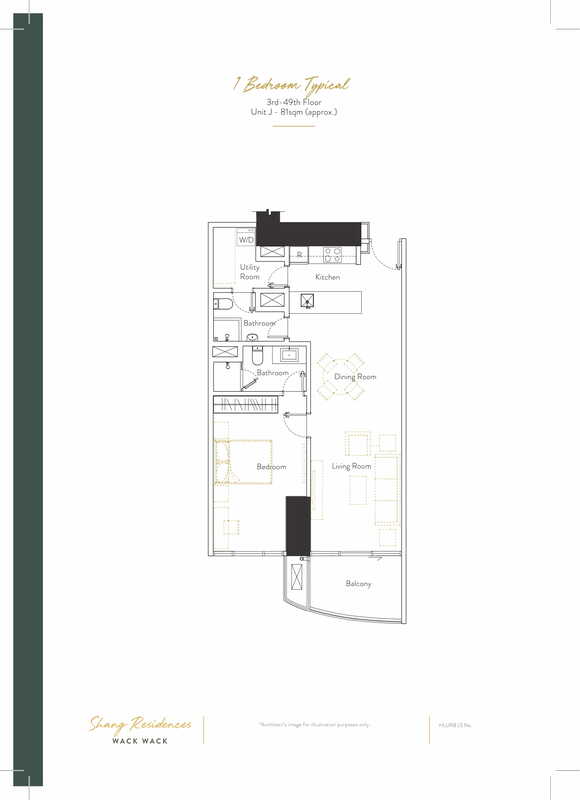 o What is the floor area of the Premium One-Bedroom unit? 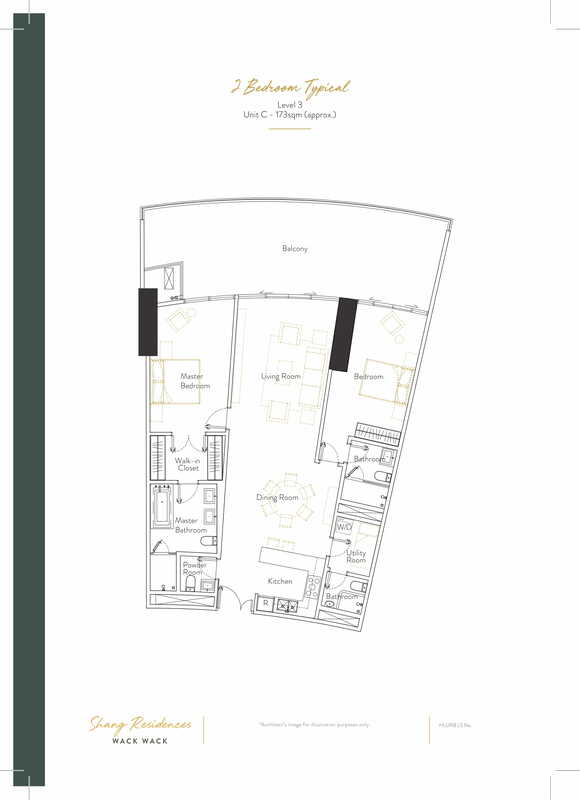 A Premium One-Bedroom unit is approximately 81 to 85 sqm in size. 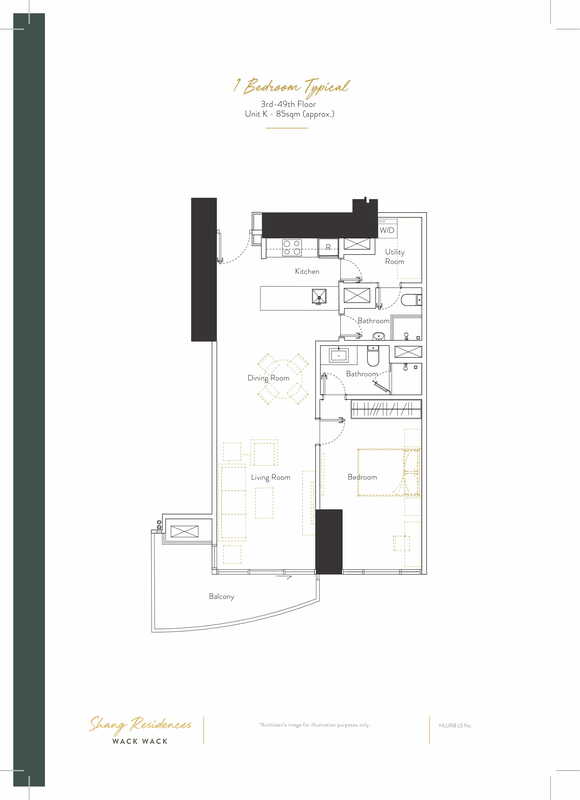 o What is the floor area of the Premium Two -Bedroom unit? 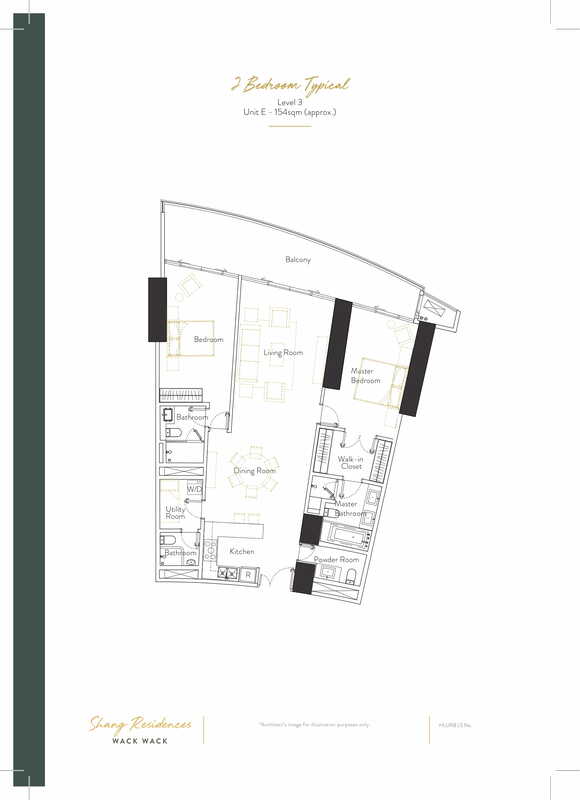 A Premium Two-Bedroom unit is approximately 142 to 145 sqm in size. 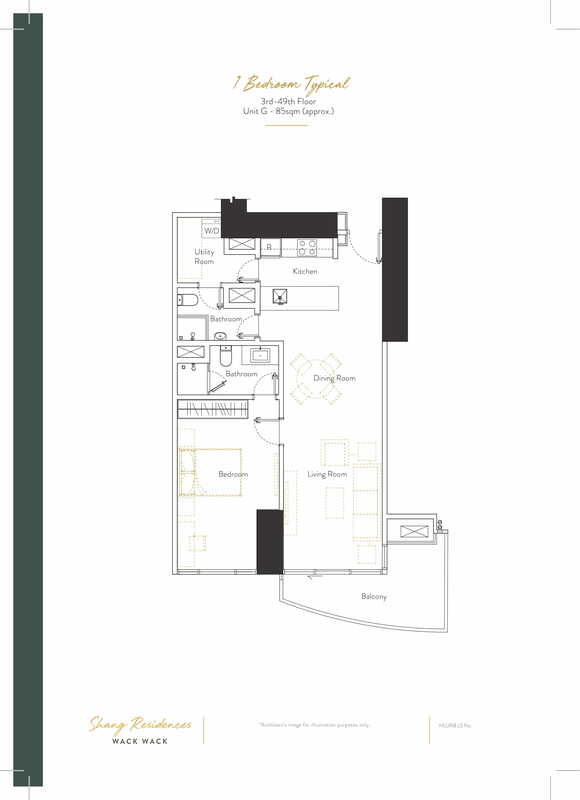 o What is the floor area of the Premium Three-Bedroom unit? 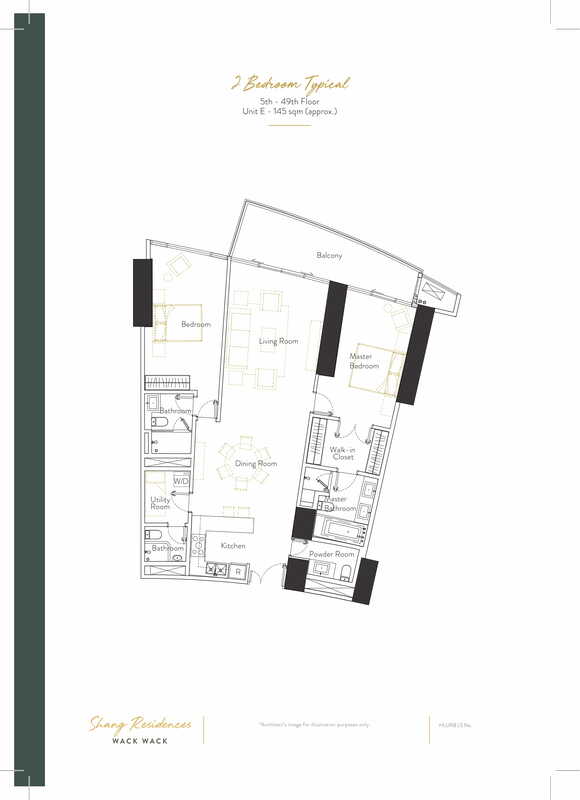 A Premium Three-Bedroom unit is approximately 238 to 282 sqm in size. 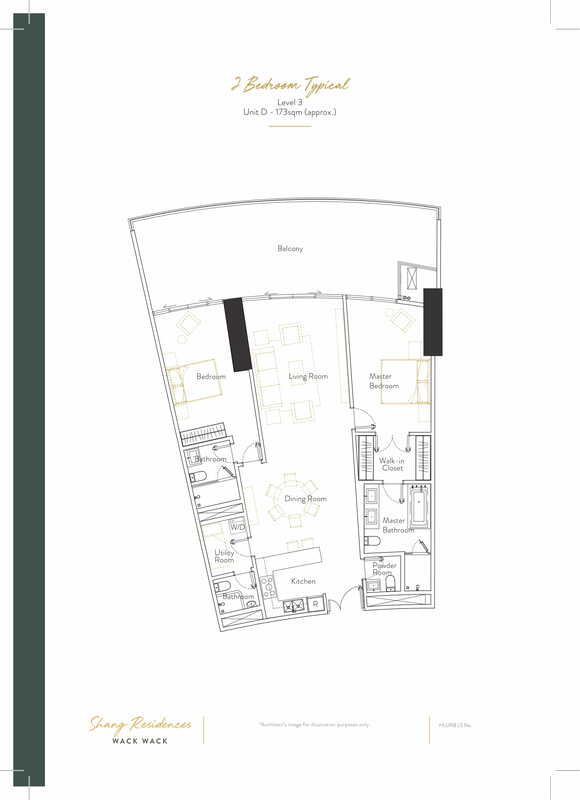 o What is the floor area of the Simplex Three-Bedroom unit? 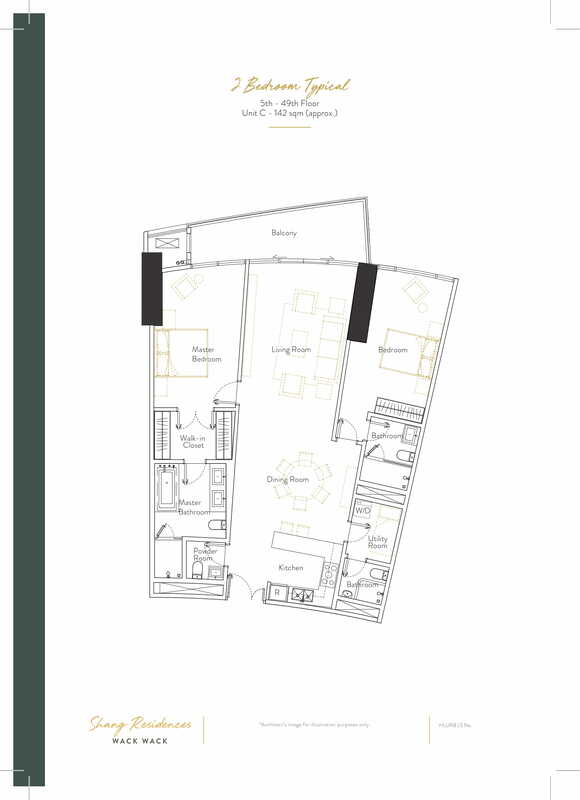 A Simplex Three-Bedroom unit is approximately 167 sqm in size. 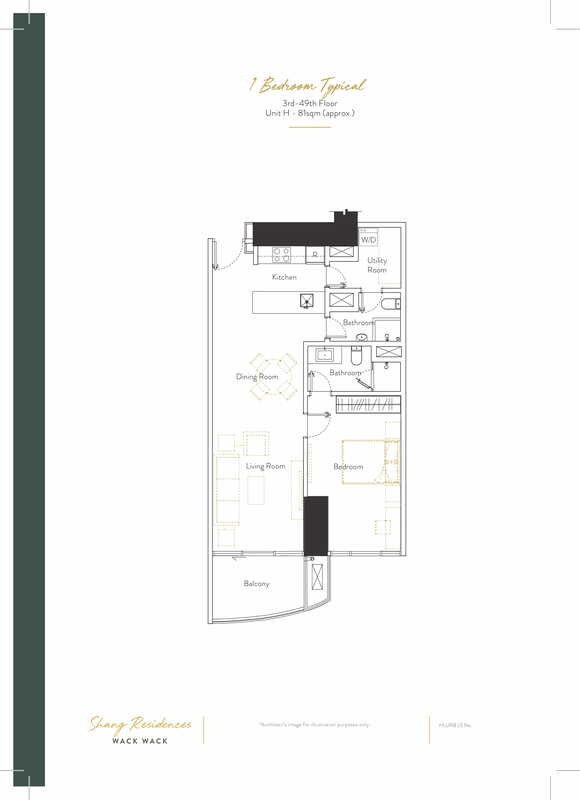 o What is the floor area of the Simplex Four -Bedroom unit? 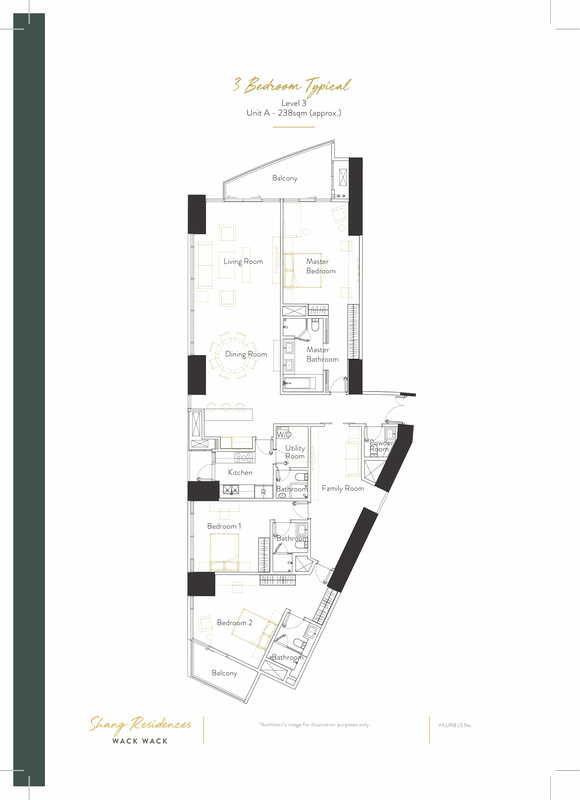 A Simplex Three-Bedroom unit is approximately 167 to 377 sqm in size. 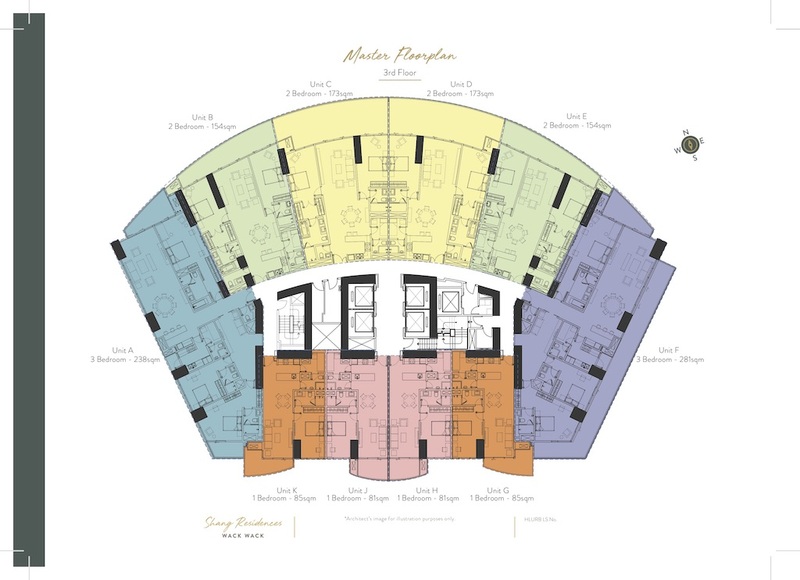 o What is the floor area of the Penthouse Four-Bedroom unit? 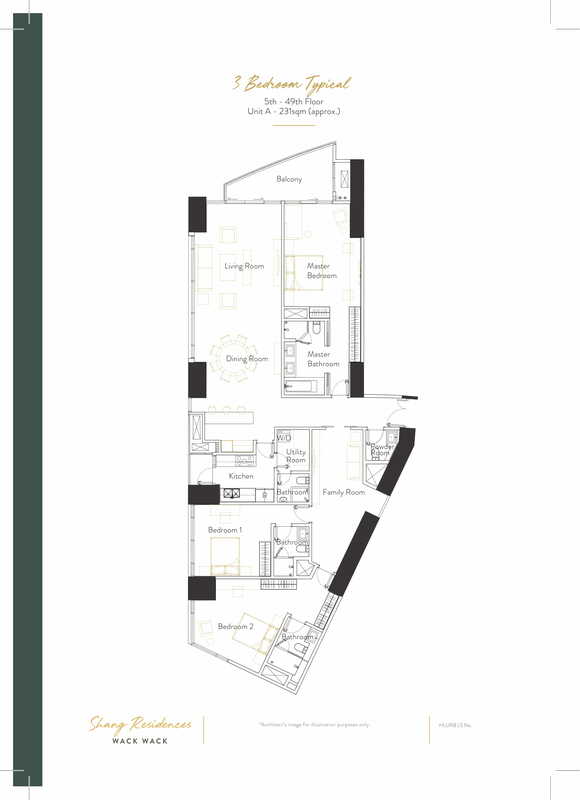 A Penthouse Four-Bedroom unit is approximately 537 to 619 sqm in size. o Do the units have balconies and terraces? 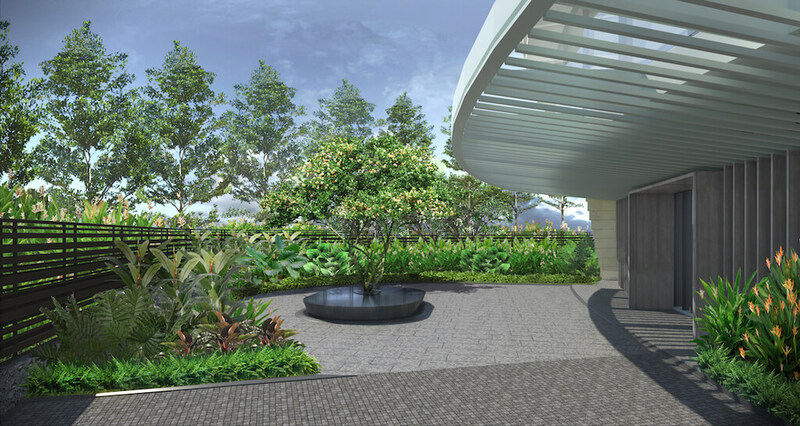 All units will have balconies and terraces. o Where are the amenities located? 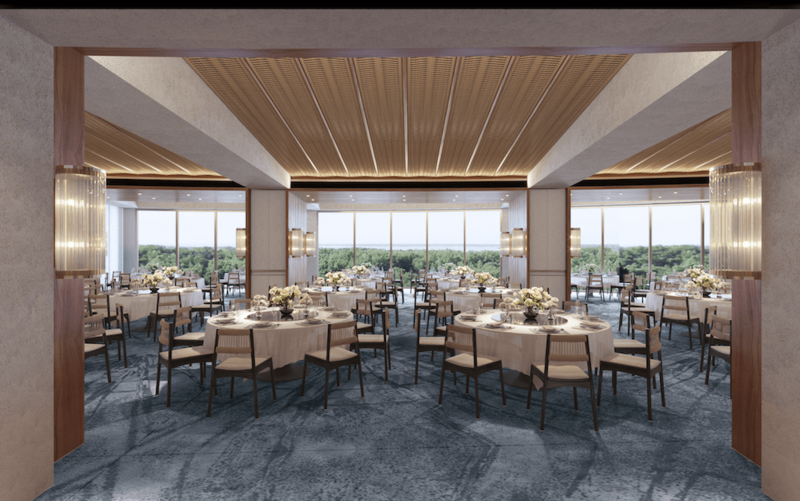 The clubhouse or amenities floor is located at level two (2). o What are the amenities? 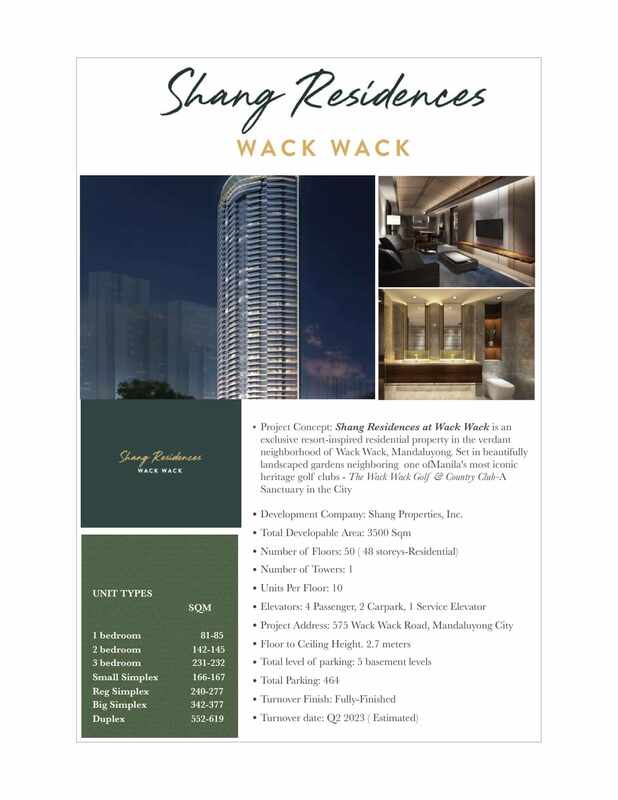 o Who is the developer of Shang Residences at Wack Wack? Shang Residences at Wack Wack is brought to you by Shang Wack Wack Properties Inc., an affiliate of Shangri-La Hotels & Resorts worldwide, and Kerry Properties Limited, one of Hong Kong’s largest property investment and development companies with premier residential and commercial projects in China, Hong Kong, Macau and Australia. 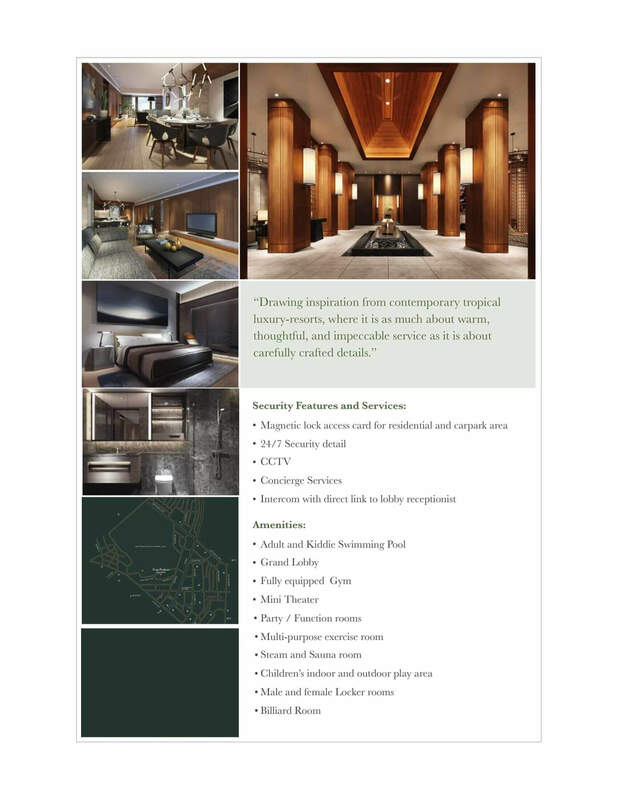 In the Philippines, it joins the other prominent developments of the group such as Shang Salcedo Place, The Shang Grand Tower, The Enterprise Center and The Rise Makati, The St. Francis Shangri-La Place, Shangri-La Plaza, One Shangri-La Place in Ortigas Center, Shangri-La at the Fort and Horizon Homes in Bonifacio Global City. o What are the requirements to purchase a unit? 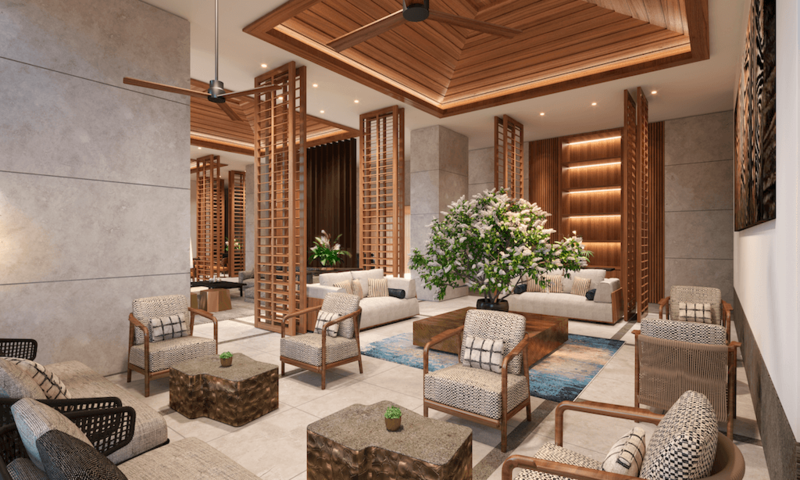 To purchase a unit at Shang Residences at Wack Wack, buyers must first pay a Reservation Fee of Php 200,000, sign the Reservation Agreement, and fill out the Buyer’s Information Sheet. The down payment is due 30 days after reservation. Post-dated checks are required for all payment schemes. For those who wish to purchase a parking slot, a reservation fee of Php 50,000 is also required. o Is the reservation fee refundable? The reservation fee is deductible from the down payment but is non-refundable. o Do I get my own title? Yes, a Condominium Certificate of Title is given for each unit, and separately for each parking slot. When is the delivery/turnover of the units? The target delivery date is approximately end of 2023.